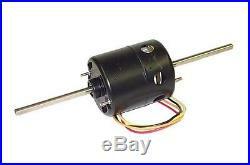 Blower motor – double shaft – 12 volt 3 speed 4 wire motor with 3/8 shafts, heavy duty ball bearing motor. Tractors: 656, 706, 756, 766, 786, 806, 856, 886, 966, 986, 1066, 1086, 1466, 1468, 1486, 1566, 1568, 1586, 2656, 2706, 2756, 2806, 2856, 3388, 3588, 3788, 4166, 4186, 4366, 4386, 4568, 4586, 4786, Hydro 100, Hydro 186. Combine: 715, 815, 915, 1420, 1440, 1460, 1470, 1480. Windrower: 4000, 5000, 5500, 8830. The item “BLOWER MOTOR International Harvester 1066 3388 886 Tractor” is in sale since Thursday, June 12, 2014. This item is in the category “Business & Industrial\Heavy Equipment Parts & Accs\Antique & Vintage Equip Parts”. The seller is “justauctions” and is located in Sparta, Michigan. This item can be shipped worldwide.